We get a lot of junk mail through the door, but I always have a look through the Valley Life magazine*, as between the small ads, recipes, and gardening tips there is usually one article featuring of old photographs of the area. Many of the scenes are still recognisable and I love trying to work out where the photographer was standing, which buildings are still there, which have been demolished, and so on. 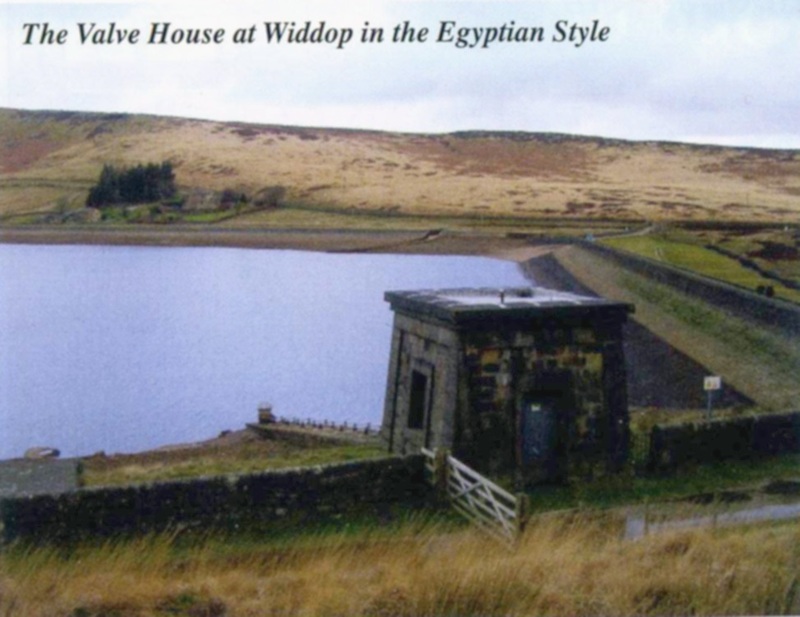 This month’s issue delves into the fascinating world of civil engineering and Victorian architecture and describes how Widdop reservoir supplies Halifax with fresh water. The reservoir was built in the 1870s and holds 640,511,000 gallons of water, but lies high above Hebden Bridge, with nearly 8 miles (as the crow flies) of hills and valleys to cross before reaching the town. Work was supervised by the excellently-named John F La Trobe Bateman (FRSE FRS MICE FRGS FGS FSA and President of the Institution of Civil Engineers in Britain 1878-9), who seems to be responsible for constructing much of the country’s water supply infrastructure at the time. A number of valleys had to be crossed en route to the city – in some places, aqueducts were built, but elsewhere an ingenious device called an inverted syphon was employed. The principle is similar to the u-bend under a sink, and as we can see here, fairly simple to set up (that site gives me flashbacks to Chemical Engineering classes. So glad I didn’t spend the next three years calculating flows). One of the syphons lies between Hollins Hall and Pecket Well, but the land on the other side of the valley is higher, so a tunnel had to be dug through the hillside. The Castle Carr tunnel is 2550 yards long and has three ventilation shafts, the deepest of which is 476 yards. They can be clearly seen on the OS 1:25,000 maps if you have one (if not Bing will be able to help you, just change the view to Ordnance Survey). 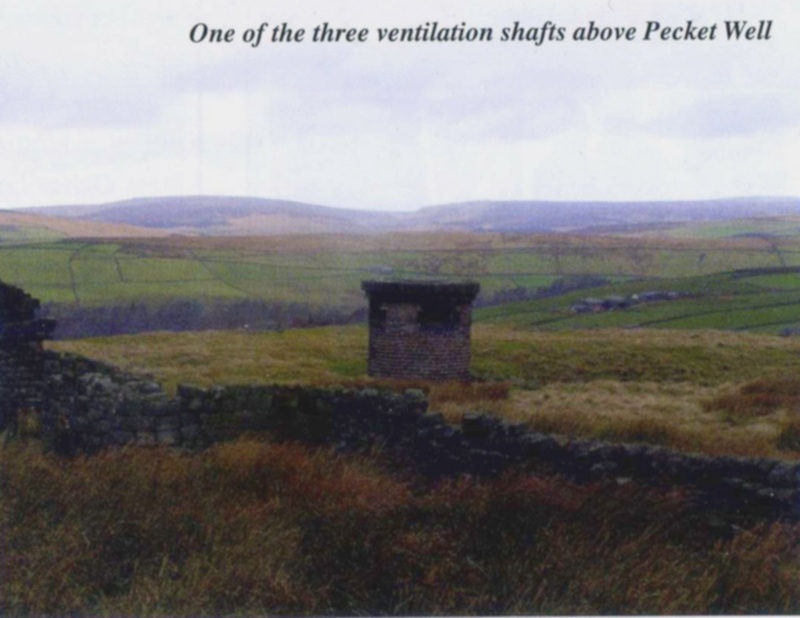 The shafts are listed by Historic England, as they show “Good examples of stonemasons work on top of the moors in an isolated location”. I’d noticed these shafts a few weeks ago when I was running up there, but couldn’t quite work out what they were. It’s too far from the railway line, so unlikely to be a train tunnel; I assumed it was a mine of some sort. It’s not a good place for mining though, as apparently the rock is so hard that the explosive charges were just blasted out of the drill holes, having no effect on the rock at all. The tunnel ends at the Castle Carr estate, a country retreat which the article says contains the highest gravity-fed water feature in the UK (though the fountains at Chatsworth and Stanway are higher. Perhaps they meant height above sea level. At 300 metres it’s pretty hard to beat). I’d never heard of this place before and it’s not surprising – it has fallen into ruin and is only open to the public one day a year. This report makes it sound like it is really worth visiting, so I’ll try and make the trip next month. Maybe I’ll get round to writing another post about it! [*] No hyperlink, as the address they give, http://www.facebook.com/Valley-Life-magazine redirects to http://www.facebook.com/valleylifemagazine, which is an Italian lifestyle magazine. Not sure what’s going on there. I’m not on Facebook, so maybe that kind of thing happens all the time. Who knows?